Born in 1973 in Tamaulipas Mexico, Rigoberto Gonzalez is among the most accomplished painters currently practicing in the Rio Grande Valley. Gonzalez received his B.F.A. from the University of Texas at Pan American and earned his M.F.A. from the prestigious New York Academy of Art. His artwork has been exhibited by museums in Sweden, Norway, Mexico and throughout the Southwest United States. Rightly lauded for the technical virtuosity of his Neo-Baroque style painting, the artist is most widely known for the provocative content of his work which often depicts disturbing imagery born of the cultural and social context in which the artwork emerges. For many, life along the Rio Grande Border is fraught by ubiquitous cartel violence and Rigoberto Gonzalez’s graphic imagery reflects this inescapable fact. But the artist’s optic is neither simply glamorous or exploitive. Instead, he depicts both the perpetrators and victims of the violence with a cold clarity and the compassionate sympathy of characters in a Biblical epic. 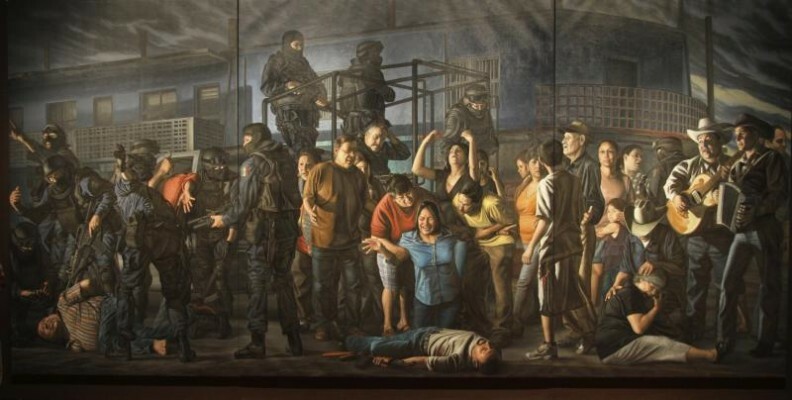 In Gonzalez’ paintings, victims may be innocent martyrs or culpable perpetrators fallen afoul of their cartel masters. He calls on the compositional devices of European painting canon to present his contemporary subject in a manner befitting the tradition of grand scale history painting as well as devotional narrative. This exhibit seeks to examine the essential role of skilled contemporary figurative painting in exploring the complex social, political and ethical issues at the epicenter of the regional frontier. It encourages the viewer to reorient their sense of the cultural center and reimagine its implication from the perspective of those living along the US/Mexico border.